The isolation of Big Creek is one of its greatest virtues. With no established road access right to the park, travelers can expect a unique experience of self-reliance and adventure. Situated where the great barrier of the Coast Mountains yields to the high plateau of the province’s interior, the park (65,982 hectares) boasts a variety of terrain, ecosystems and climatic zones. The park's landscapes include alpine lakes and dramatic mountains in the south as well as gently rolling forestlands, volcanic hills and lava formations as well as the flat, forested Chilcotin Plateau in the north. Snow and rain, driven from the North Pacific, is captured by the highest peaks of the Coast Mountains, and slowly moves to low-lying, poorly drained meadows and marshes. The combination of features is ideal for supporting a variety of wildlife. In ancient times, native hunters came to the Big Creek area for subsistence hunting and food gathering. Today it is of critical importance to moose and a wide variety of small furbearers that utilize the marshes. It also supports the threatened California bighorn sheep with habitat and migration routes. Riparian zones are home to innumerable songbirds, waterfowl, amphibians, reptiles, and fish. Grizzly bear move from alpine meadows to wetlands and forests. Wolves, black bear, cougar, and mountain goats also roam the wilderness and survive because of the relatively low human impact. Activities are centered on self-sufficient adventuring. Utilizing a network of historical trails, visitors can move by foot, horseback or mountain bike, and enjoy the park’s scenery and wildlife. Cattle Grazing has a long history in the area, and continues, with seasonal camps set up by ranchers. Hunting is permitted and there is also some fishing, though productivity is limited by the turbidity of much of the water. Beautiful alpine hiking waits in the southern regions of the park. 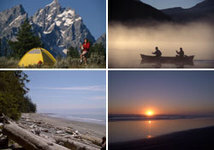 There are no camping facilities provided, only back-country opportunities. Be conservative with using firewood and cautious with campfires, as some areas, particularly grasslands, become very dry. Be prepared to bring a portable stove for cooking. Situated about 100 km in a direct line southwest of Williams Lake, there are no good roads into the area. Two routes, following logging roads, link to hiking and horse trails. These can then be used to access the park via Relay Creek and Tyaughton Creek: Drive approximately 69km on Carpenter Lake Road west of Lillooet. Turn right on Marshall Lake Road. Zero odometer here. Stay left at 3km. At 11.6km, stay right on to the Mud Creek Main Road. 14.8km, cross bridge. 17.5km, stay left. 24.5km, stay left. 25.6km, cross bridge. 29.6km, stay right. 36km, cross bridge. 36.8km, stay right. 41.2km, turn left onto the Mud Creek – Paradise Creek Road. Drive down the hill to 43km, Tyaughton Creek Forest Recreation Site. Turn right just past the recreation site. Do not take trailers onto this road. This road is not maintained and may be washed out at any point, proceed with caution. 52.7km, stay left. 54.3km, stay left. 54.9km, stay left. 57.2km, stay left. 57.7km, cross small creek at the edge of a logging landing. It is not recommended taking 2 wheel drive vehicles beyond this point. 64.7km, stay left. 65km, drive past the old mining camp. 66.3km, Relay Creek Forest Service Recreation Site. Northern route: Few park visitors use this access. However, there is a rough trail that parallels Big Creek, and which is best suited for horseback riding. Follow the logging road (2000 road) that leaves Highway 20 at Riske Creek. Travel to approximately 51 km, turn left onto the 2400 road. Stay on this road until you reach a green gate. Park here, follow the road approximately 2.5km past the gate, turn right and follow the old road/trail to Lorna Lake and the Dil-Dil Plateau. Roads become very slippery when wet: four-wheel drive, shovel and tire chains are recommended. Recommended maps: 1:50,000 topographic maps of the park are available at most map retailers: 92-O/2, 92-O/3, 92-O/6, and 92-O/7.